The all-purpose medium duty TEKTON 4 in. Swivel Bench Vise is the bench-top work horse your garage or shop can't live without. Whether you are repairing vehicles, metalworking, or assembling parts, you can work better, faster, and safer knowing your workpiece is properly secured. Just lock it in and thread, fasten, build, bend, shape, or sharpen with confidence. 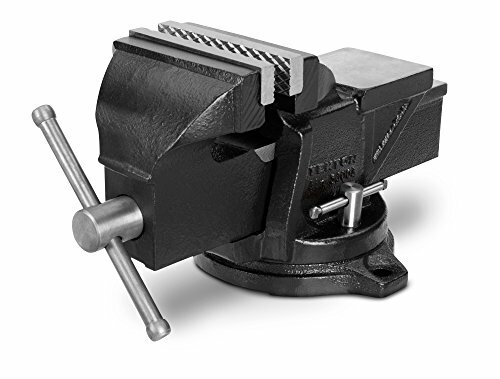 The vise is made from 30,000 PSI cast iron, so durability and dependability are built in. Put your project in the sure grip of the replaceable nonslip serrated steel jaws and it won't budge. For forming and shaping metal pieces, the polished anvil offers a smooth, consistent work surface. Rotate the vise around its 120-degree swivel base and you can position your work in just the right spot. Once there, dual lock-down nuts keep it in place. Turn the sliding T-bar handle and the jaw glides smoothly along the Acme-threaded main screw without binding or chattering, even as clamping pressure increases. Anvil size: 2-5/8 in by 2-5/8 in. Mounting holes (3): 3/8 in.